Soyuz MS-06 features a crew of two ISS veterans and one fist-time flier. Commander Aleksandr Misurkin, coming from a military background in the Russian Air Force, flew to space for the first time in 2013 and spent 166 days in orbit as part of Expedition 35/36, also participating in three spacewalks for a total of 20 hours. Joe Acaba – joining the Expedition 53/54 crew on relatively short notice – flew on the Space Shuttle in 2009 and was part of the Expedition 31/32 crew in 2012, accumulating 137 days off the planet. Selected by NASA in 2009, Mark Vande Hei will be making his first flight to space on Soyuz MS-06, having served in the U.S. Army’s space division and working as a Shuttle & ISS Flight Controller prior to his selection as an astronaut. Soyuz flights are still recovering from the schedule impact of a technical issue earlier this year – encountered by the Soyuz #734 vehicle as it was preparing for launch on the Soyuz MS-04 mission in late March when a leak was discovered on the vehicle’s cooling system. This prompted the replacement of the #734 vehicle with Soyuz #735, originally intended to fly on the MS-05 mission – causing a four-week delay to the MS-04 mission to bring the #735 vehicle forward in its processing flow while #734 went back to the factory for repairs. Soyuz MS-05 slipped two months from late May to a July 28 launch date to provide time for Soyuz #736 to be readied for the mission since #734 was not expected to be ready for that mission. Revised schedules showed #734 flying on the MS-06 mission on September 12, creating a busy period of Soyuz mission operations with two launches and one landing in a period of less than seven weeks. 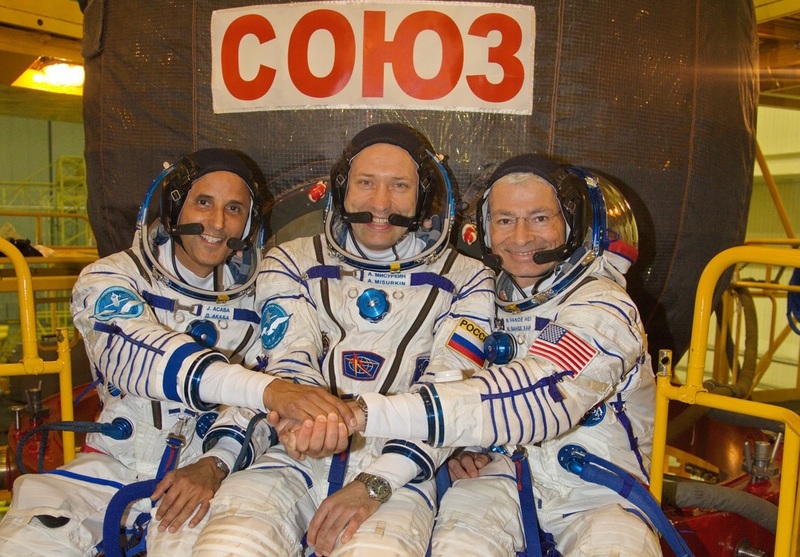 Soyuz Commander Aleksandr Misurkin and NASA’s Mark Vande Hei also had an interesting path to their prime crew assignment – originally starting out on the crew of Soyuz MS-04 together with Cosmonaut Nikolai Tikhonov. As part of standard procedure, they were in place at the Baikonur Cosmodrome in October 2016 for the launch of Soyuz MS-02 for which they served as backups. Then, in November, Russia announced the decision to cut its permanent ISS crew to two members starting in 2017 as a cost-saving measure and to respond to work load requirements on ISS. The decision to reduce the Russian ISS crew complement impacted the near-term Soyuz crew roster with Tikhonov losing his flight assignment (now expected NET 2019) and Misurkin & Vande Hei moving to the MS-06 mission and serving as backups for Soyuz MS-05. The Russian crew reduction meant that seats on Soyuz missions MS-06 and MS-08 would be empty and NASA acquired the seats through Boeing after Soyuz builder RSC Energia offered the open seats to Boeing to settle a financial dispute over the dismantling of the Sea Launch endeavor. 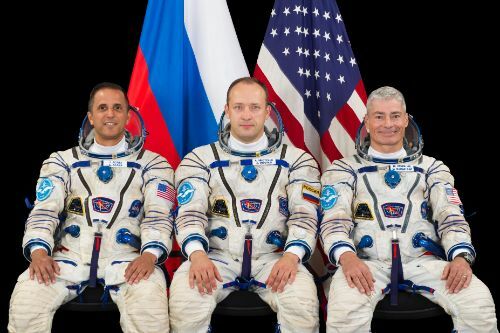 NASA announced the additional crew members for ISS Expeditions 53 through 56 in March of this year with ISS veteran Joe Acaba being called into action on relatively short notice with only half a year to prepare for a long-duration space mission. The Soyuz MS-08 seat will be filled by Shuttle veteran Ricky Arnold who can enjoy a normal preparations flow for launch in March 2018. Misurkin and Vande Hei, together with Norishige Kanai who will fly on Soyuz MS-07, were again present at Baikonur for two weeks in July, supporting the crew of Soyuz MS-05 as backups. These backup assignments so close to their own planned launch required some of the typical schedule timelines to be adjusted. Traveling back to Star City, Misurkin and Vande Hei were joined by Flight Engineer #2 Joe Acaba for ISS and Soyuz simulations, held August 18 through 25. The three prime crew members along with their backups Anton Shkaplerov, Scott Tingle and Shannon Walker traveled to the Baikonur Cosmodrome on Sunday for a trip of a day and a half. On Monday, the prime and backup crew visited the Soyuz MS-06 spacecraft at the Site 254 processing hall for an initial familiarization before completing a checkout of their Sokol Launch and Entry Suits and going through a dressed ingress rehearsal, communication and systems checks on board the Soyuz vehicle. 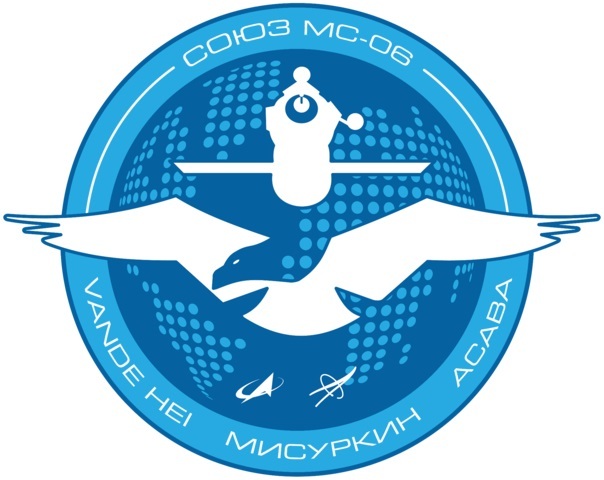 Further equipment and cargo familiarization followed later in the day before the crews were expected to again board their GCTC planes to return to Moscow for another week of pre-flight exams as part of a revised schedule for the MS-06 mission. 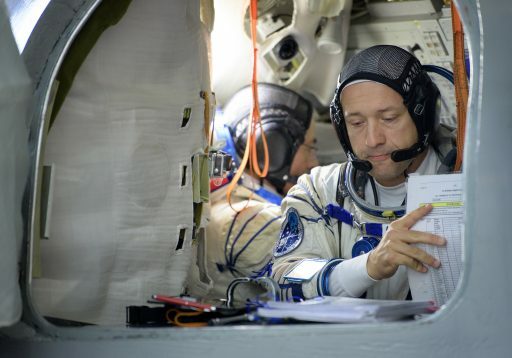 Normally, pre-flight exams would be complete before the crew travels to Baikonur for a two-week block of launch preparations at the launch site. In case of Soyuz MS-06, the crew has several more open exams in nominal and off-nominal flight modes to be completed over the course of the next eight days while the MS-06 spacecraft has to stick to its own schedule to be loaded with cargo & propellant followed by integration with the Soyuz launch vehicle. These two separate flows were reconciled by having the crew drop in for a brief visit to Baikonur before going back to Moscow to deal with their final simulator runs and traditional pre-launch activities. 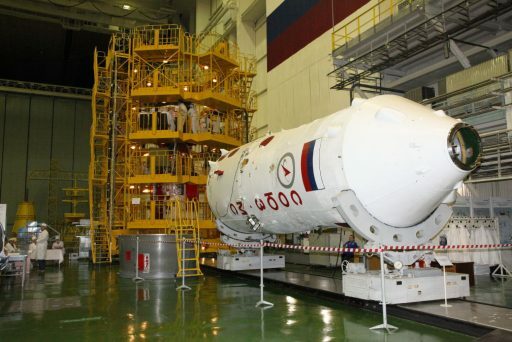 They are scheduled to return to Baikonur on September 6th for a final week of preparations and pre-flight quarantine. In the meantime, their Soyuz spacecraft will undergo hazardous processing to receive propellants and pressurized gases to return to Site 254 in time for the crew’s second visit. Soyuz missions have been occurring out of the usual cadence this year as a consequence of the schedule upset caused by the troubles of Soyuz #734 back in January. Flight durations are being adjusted to move back to the normal rhythm with Soyuz launches in March, May, September and November by the Soyuz MS-08 mission that will mark the first Soyuz of 2018. Soyuz MS-07 was recently moved up ten days from a December 27 launch target deconflict with the holidays on the U.S. side which will require the mission to use the longer two-day rendezvous scheme. Setting up for the Soyuz MS-06 mission, the International Space Station performed an 0.35 m/s reboost maneuver on Sunday that served two purposes in terms of phasing setup for the upcoming Soyuz launch as well as the landing of Soyuz MS-04 targeted for September 3rd to bring Fyodor Yurchikhin and Jack Fischer back to Earth after a five and a half-month mission and return Peggy Whitson to Terra Firma after a mission of 289 days.